Print for Love of Wood a small design and letterpress studio based in the Pennines, Lancashire dedicated to the love of wood type and tree hugging paper. 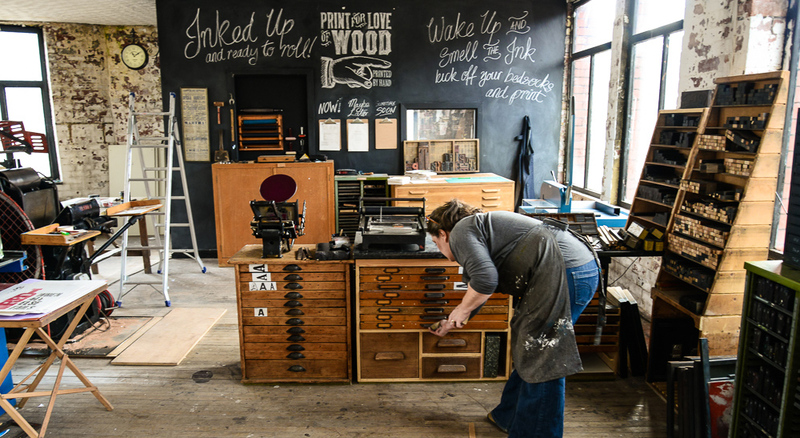 It is a labour of love by award winning graphic designer Jacqui Sharples, a Lancashire ‘lass’ inspired by a passion for print, the smell of ink, vintage typography and her collection of wood type. Jacqui prints in house on a range of vintage and antique printing presses using traditional and modern letterpress techniques. The paper and card is carefully sourced tree friendly stock and in most cases is 100% recycled. Ink is mixed by hand and mostly recycled from printers who have closed down due to the impact of digital on traditional print methods.